I applaud you for taking a break from watching cable news until your head hurts. Sit down, relax and take a deep breath. This is and always will be a politics-free zone (and my social media channels are no different), because that’s not why you and I hang out together. I would much rather do what we always do – discuss all the delicious, healthful recipes I want you to try and share, recipes which will bring loved ones to our tables where it is appropriate to discuss the whys and hows of the world. As for me, I am deep into teaching Thanksgiving classes right now. It really puts me in the holiday spirit, so I am super excited for the holiday. My daughters are coming home from college and we will host a lot of our Thanksgiving “regulars.” What I have been hearing in my classes though is that many people still don’t have their menus set yet. It’s probably a good time to nail that down. 😉 I will give you a preview of the two recipes I am posting next week (I hope!) — a salted maple apple galette and a stuffing with turkey sausage, fennel and apples. Both are outstanding and received rave reviews in my classes last year. Consider them as you firm up your menu. I try to find a balance on my menu of dishes that are classics, like mashed potatoes and sweet potato casserole, paired with ones that are more modern and fresh, like my favorite Brussels sprout leaf salad and roasted delicata squash and apple salad. When I taught this recipe last year, all my “young”(i.e., under 35) students deemed this one the favorite of the class because it’s a little different and really delicious. Winter squash of any sort is absolutely scrumptious roasted until tender and caramelized. I am particularly fond of acorn squash since it doesn’t require peeling before roasting. What a gift! Sometimes the skin on acorn squash gets tender enough that you can eat it. Just roasted acorn squash with salt and pepper is a perfectly lovely, basic side dish for Thanksgiving or any fall/winter dinner. 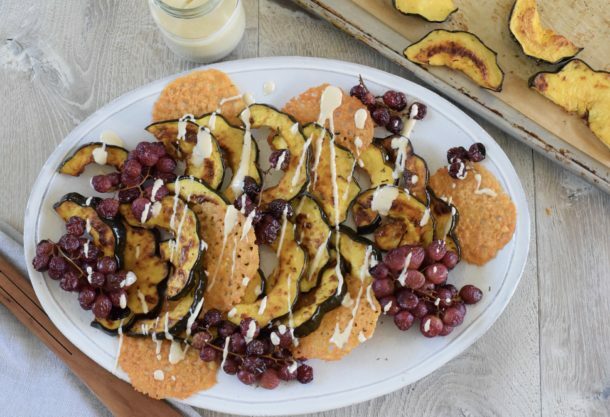 But add in my new favorite, roasted grapes, with crispy rounds of parmesan and a creamy pine nut dressing, and acorn squash is new and anything but basic. As you know, I love textural and flavor contrasts, so the sweet and salty, plus the soft and creamy with the crunchy is amazing. If all of this seems like too many components, too much going on, then drop the frico or the pine nut dressing, although both can be prepared the day before. I was also thinking that if you have vegetarians joining you, this would be a perfect option since there is a protein boost from the parmesan and the pine nut dressing. (But if you want to make Tofurkey, go right ahead!) 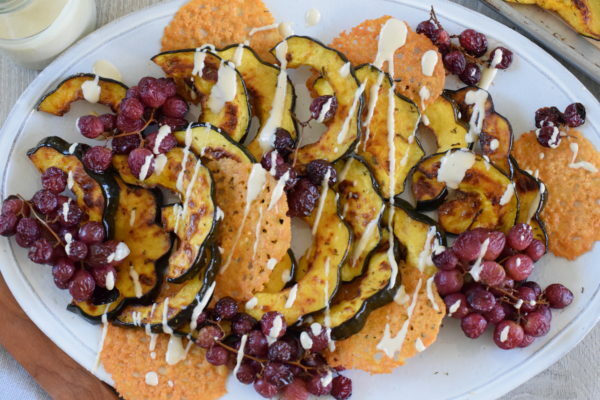 The frico, which is just Parmesan baked until it turns crisp and golden, is also nice in other salads or on a cheeseboard, as are the roasted grapes, which you must try! I made some crostini recently for a meeting with honey goat cheese, roasted grapes and roasted butternut squash. As simple as they were, these toasts were comforting and delicious, something on which everyone could agree. Thanksgiving couldn’t be coming at a better time, don’t you think? 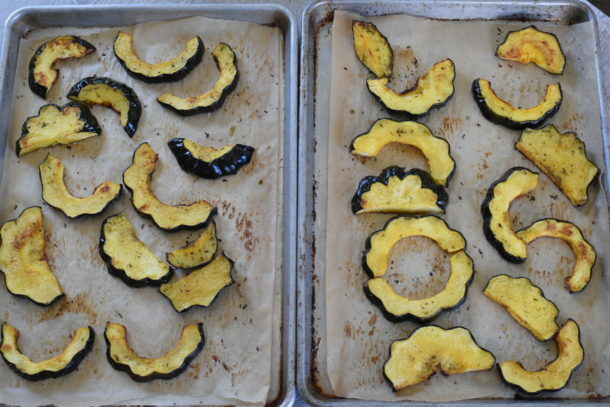 To roast the squash: Preheat oven to 450 degrees. Line two baking sheets with unbleached parchment paper. Halve squash lengthwise, then cut off and discard stem ends. Scoop out seeds and cut squash crosswise (for a pretty scalloped edge) or lengthwise into ¾-inch wide wedges. Toss squash with 2 Tablespoons oil and rosemary in a bowl then arrange cut sides down on prepared pans. Sprinkle with ¾ teaspoon salt and black pepper to taste. Roast squash, switching position of pans halfway through roasting, until squash is tender and undersides of wedges are golden brown, 25 to 35 minutes. To roast grapes: Lower the oven to 425 degrees. Toss grapes with remaining 2 Tablespoons oil, arrange on a parchment lined baking sheet and sprinkle with salt and pepper. 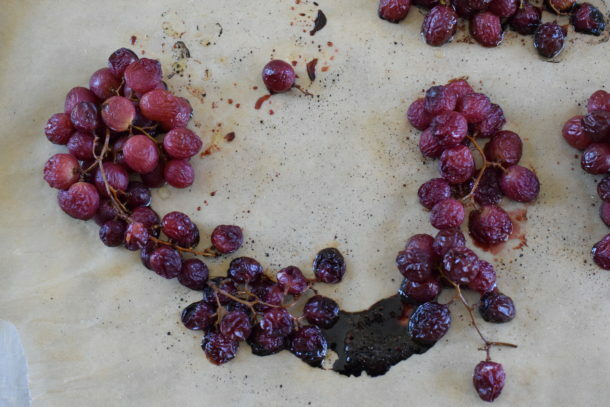 Roast grapes until they have shriveled slightly, about 30 minutes. To make frico, lower the oven temperature to 375 degrees. Scoop 6 mounds of grated Parmesan cheese (1 Tablespoon per mound) onto a parchment lined baking sheets, spreading each mound to about 3” wide and spacing them at least 1” apart. Bake cheese until melted and light brown, 10-12 minutes. Frico will still be soft/pliable when removing from oven. Allow to cool on the baking sheet to harden and get crispy. Break into bite size pieces. 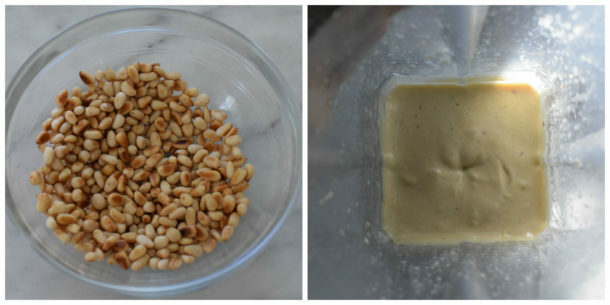 To make dressing: Add all ingredients to a blender or food processor and blend until emulsified and creamy. 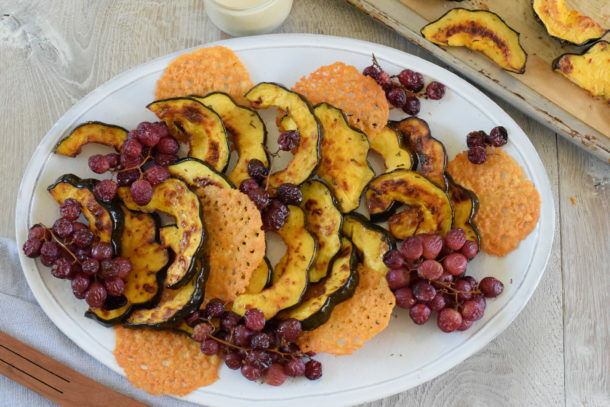 To serve: Arrange acorn squash on a platter and scatter grapes over the wedges. Drizzle with some pine nut dressing and top with frico. Serve remaining dressing on the side. Squash can be served warm or room temperature. Acorn squash can be cut the day before. Acorn squash and grapes can be roasted Thanksgiving morning and served at room temperature or warmed in the oven just before serving. Frico can be made 2 days in advance. Dressing can be made a day in advance. Bring to room temperature before serving. All I can say is OMG ! !